BDN fields a lot of questions about branding, and that’s what inspired this month’s series. If you’ve already determined that you have a branding problem, this blog is for you. 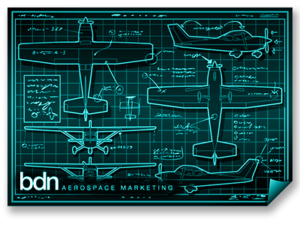 Here we outline a process for branding and walk you through what’s required to create or revamp your aerospace business brand strategy. You’ll need to conduct research in three key focus areas to gather the insights, data and intelligence that will inform your brand strategy. Tip: To keep your branding project on track, make sure you understand both company goals and sales goals, and how the brand will support them. Tip: Ask questions about the decision-making and buying process. Where do your customers get information? How do they research products? What factors most influence their buying decisions? Tip: Does everyone’s messaging sound the same? Do visual identities seem similar? This is a great opportunity to look and sound different. Once all information has been gathered, analyze and synthesize what you have learned and refer to it in making these upcoming critical brand decisions. Your brand strategy helps establish your company’s best possible position in the market. Think of it as your aerospace and defense sweet spot. Above all else, what one thing do you want to be known for? Tip: Resist the temptation to try and be everything to everyone. It dilutes the brand you are working so hard to create. What one thing really makes you different? How do you add and deliver value to your customers? Tip: This needs to be more than lip service about “quality” or “passion.” Everyone has those messages. This statement needs to capture the essence of what make you different than every other provider. Now you begin the process of creatively translating everything you’ve learned so far. All-too-often this is where branding initiatives begin and end. But shortchanging initial steps in the process will leave you with a brand that lacks substance and meaning. Making sure that your definition aligns with your prospects’ needs, preferences and pain points, detail how you want to be perceived and how you want people to feel, think and talk about you. Are you a house of brands? A branded house? Or something else? What are the elements of your brand and how do they all work together? Tip: Keep your structure simple and memorable. Too many companies create brand confusion by naming and designing logos for everything under the sun. What is your voice and overall sensibility? Is it highly technical? Or is it something more human? Lofty and formal? Or down to earth and approachable? Tip: You can’t fake this. Whatever you decide to be; be authentic. This encompasses your story, value proposition, key supporting messages and a tagline, if appropriate. Tip: Make it fresh and memorable. Don’t settle for something that is boring and predictable or full of buzzwords. Need help? Download BDN's Guide to Crushing Your Competition with the Perfect Value Proposition. From your logo and color palette to your fonts and photos, what does your brand look like? Tip: Start with a mood board and get incremental buy-in from a few key stakeholders. Always move the discussion away from subjective opinions, have a solid rationale to back your recommendations and stay focused on the real audience. This is all about your company's core values and how you live and breathe the brand internally. How will the brand manifest within your company? What are expectations for employee performance and behavior? Tip: It’s essential that the CEO believes in, embodies and champions the brand. Your branding project cannot succeed without this executive-level buy-in. Thanks for reading! If you liked this blog, these other resources about B2B branding may also be of interest. Bop Design developed a Quick Reference Guide for B2B Branding that includes helpful definitions, dos and don’ts, and more. This Strategic Marketing Roadmap for small- to medium-size businesses emphasizes the branding process. Shout out to Marketing Mo for this in-depth resource. Looking for expert assistance? Download BDN’s Guide to Selecting a Professional Marketing Firm.